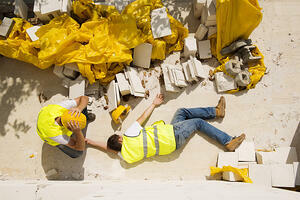 Being struck by an object on the job is one of the leading causes of injuries and deaths in the construction industry. According to OSHA, struck-by hazards are one of four most deadly hazards in the construction industry and account for around 10% of all industry fatalities annually with 75% of those fatalities occurring from being struck by heavy equipment such as cranes and trucks. Struck by injuries may result from falling, swinging or rolling objects where the injury is created by impact. Struck-by hazards are present any time there is the possibility a worker can be struck or hit by an object. These hazards may be materials being moved overhead, working or walking under elevated work surfaces, working near suspended loads, near traffic on worksites, with power tools, and when activities such as pushing, pulling or prying are being performed that can create flying objects. Workers and employers should always be mindful of hazards and alert to one’s surroundings is critical when it comes to preventing struck-by injuries. When working with vehicles, workers should always stand clear of vehicles lifting or dumping loads and exercise caution around unbalanced loads. When materials are overhead they should avoid standing near or below them. Likewise the materials must be secure and even prior to lifting in order to prevent them from slipping. It is also important that materials should be stacked properly in order to avoid the potential of falls or collapse as well as provide warning signs to protect nearby workers. All vehicles must have proper brake systems and the rear view mirror must not have an obstructed view. Workers should always wear proper PPE such as hard hats, safety glasses, goggles and face shields to help protect from workers from falling objects. Strive to maintain a safe distance outside of the swing radius for cranes and backhoes. Always make sure bulldozer and scraper blades are lowered or blocked when not in use. Workers should have foreknowledge on how to use power tools correctly in order to not create flying objects. Inspections should be done regularly to ensure that the tools are working properly. Barricade all hazardous areas and have warning signs when danger is near. Workers should reduce the amount of compressed air for cleaning to be under 30psi and only use it when proper PPE is used. By following these simple tips and staying current with OSHA safety regulations employers can be sure that they are staying proactive to protect their workers from the risk of struck-by injuries. For more information on safety training download our free safety manager's training guide to effective training strategies.